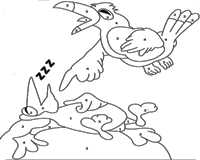 This ensemble of coloring worksheets is specifically designed to make learning fun for little cherubs! 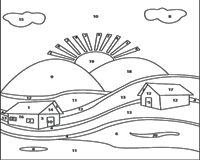 Our interactive color-by-numbers worksheets will keep little hands thoroughly engaged as they use the color codes provided to shade the pictures. Children will additionally pick up the nuances of identifying numbers up to 20. A perfect launch pad for little ones to identify numbers up to 5 and recognize primary colors! 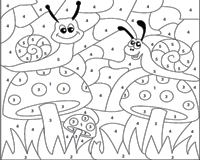 Use the color code to complete this series of fun-filled worksheets. Boost your child's confidence in identifying numbers up to 10 and also help them improve their fine motor skills. Go ahead and create a riot of color with ten colors at your disposal! 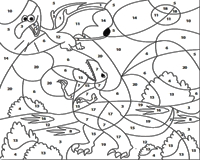 This collection of color-by-numbers worksheets are sure to keep young ones engaged by using a color code that may apply to more than one number in the range of 1 to 20. Bring color to a sunset, a circus elephant and more! Strengthen your little one's foundation with a reiteration of numbers up to 5. Use the color code provided that is guaranteed to bring out the creative streak of every child to the fore! 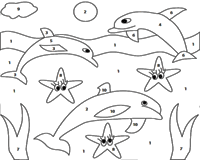 Help your child grasp the basics of identifying numbers up to 10 which include pictures of dolphins, cartoon characters and a scene at a lake. Breathe life into them by using the color code provided! Get your children to shade these thoroughly engaging worksheets with numbers up to 20 that include the ever lovable Tom and Jerry at their wackiest best! 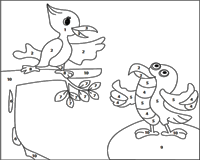 Bring out the spark in your child with these intricate coloring worksheets! Use the color code to get their creative juices flowing. You may end up 'Finding Nemo' and other interesting characters! 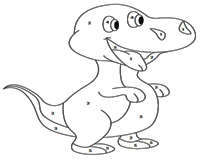 A variety of themes in this series of worksheets will help children recall numbers up to 10. A range of ten hues has been provided in the color code to help you unravel the mystery pictures. Get your most loved crayons or watercolors out of their boxes and run a riot of colors! 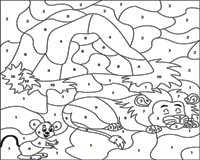 Use the color code provided to reveal the mysterious pictures that lay in the background of this set of color-by-numbers worksheets.